Designing mobile interfaces requires a lot of thought and a numerous factors to consider. With the powerful tools to express themselves, designers have the flexibility to play with a lot of UI elements. Font is one important element which adds elegance to the interfaces. 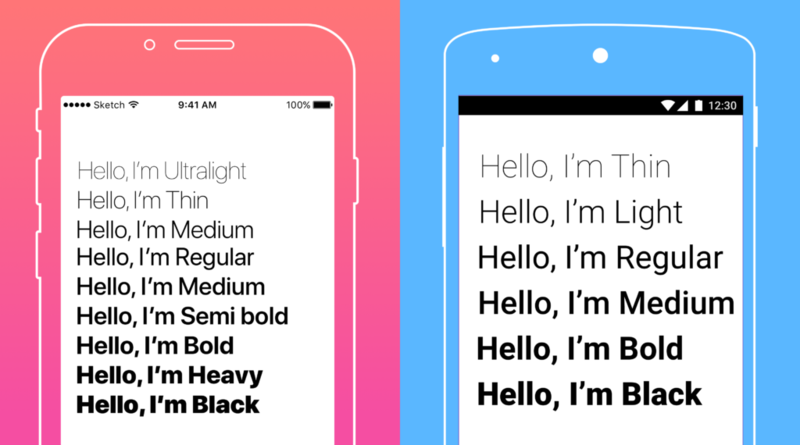 This article talks specifically about font weights and how they help build graceful mobile interfaces. While font weight is something that doesn’t strike us immediately (given the numerous aspects of designs), it could be one of the basic elements that makes up the skeleton of good mobile app design. Font Weights – why are they important? Explained in simple words – font weight is defined as the thickness of character outlines relative to their height. Typefaces make a variety (usually about four to six) of font weights available to choose from, most commonly familiar ones may be bold, italics and regular. The above infographic showcases most commonly used font weights in mobile apps – iOS and Android, respectively. Posted in Design, Mobile Apps, User Experience, UX / UI and tagged Design, Font, UX / UI on August 13, 2017 by admin.